I pondered over Jared’s request to write about our trip from my perspective. Thousands of memories, images, and thoughts flooded my brain. This left me paralyzed as to how to fulfill this request without leaving anything out, yet being able to convey in an article the magnificence of our trip, without writing a novel. I could have chosen to write about all the places we visited but our photo album will speak for itself. After that came the choice of highlights of the trip. How do I choose between the specialness of family, culinary experiences (especially the fruit), the culture, the people, jungles (orangutans, monkeys, crocodiles –oh my) and I dare not forget the mosquitos. Rice paddies, batik, chickens, beaches, temples, motorbikes-traffic (Jakarta has L.A. beat). Of course I would be remiss if I did not mention Indonesian airports, cigarette smoke, “unusual’ bathroom facilities and rain, more rain and humidity. Humor aside not only having our nuclear family together in one place, but Lesley and Adam from South Africa was the number one highlight followed closely by an adventure like no other we have ever experienced before in our travels. Seeing Jared and Max spending time together along with their cousin Adam as though no time had passed keeps life in perspective. 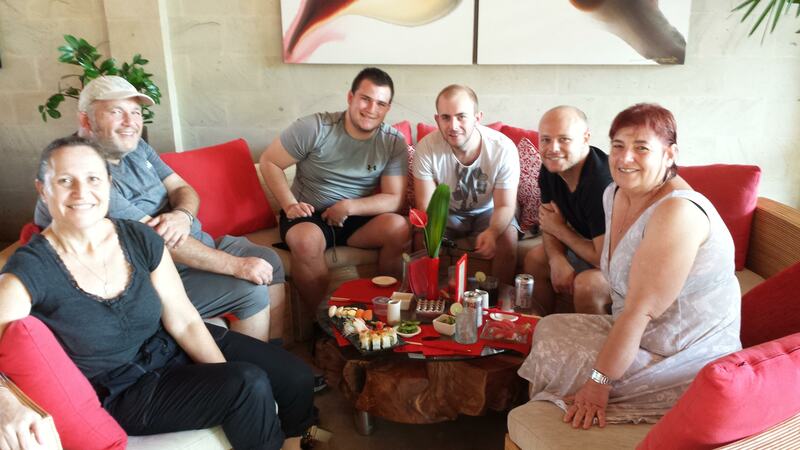 Family and teachers from the school enjoying dinner together. From the beginning of our adventure the generosity of the people did not go unnoticed. Despite being in a country where time appears to have little meaning, where everyone works, contributes to their families, community and society, they effortlessly included us in whatever they were doing without a hiccup in their stride. As each member of our family arrived (hence we got to know the airports really well besides flying to different areas) each was welcomed with the same warmth and interest. We were fortunate to not only tour and experience a completely different country and culture but to also see first-hand a little of what Jared is embracing and learning and catch a glimpse in the window of his incredible life journey. 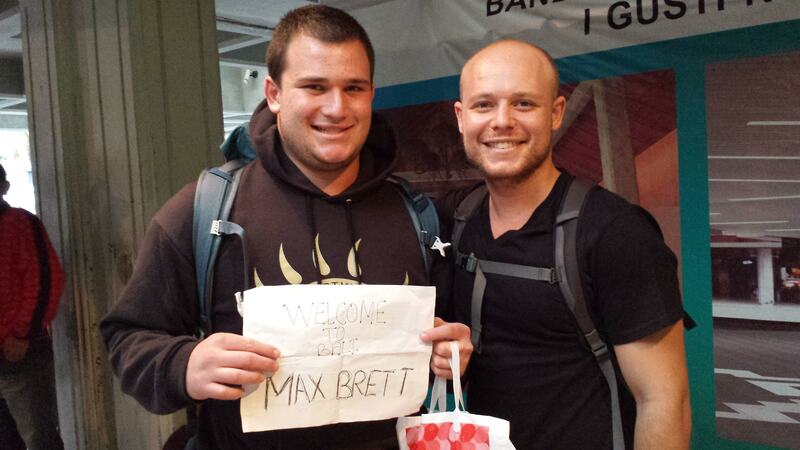 Max and his sign upon arrival. Despite Jared’s initial adjustment to an entirely new culture we cannot be prouder of how well he has embraced the experiences and challenges. He is a part of the people, surprising us as well as the natives with his amazing mastery of Bhasa Indonesia (this served us well during our travels and shopping). Besides the language he has embraced the food (eating mostly chicken and rice-no meal is complete without rice) and trying and eating anything that comes his way. 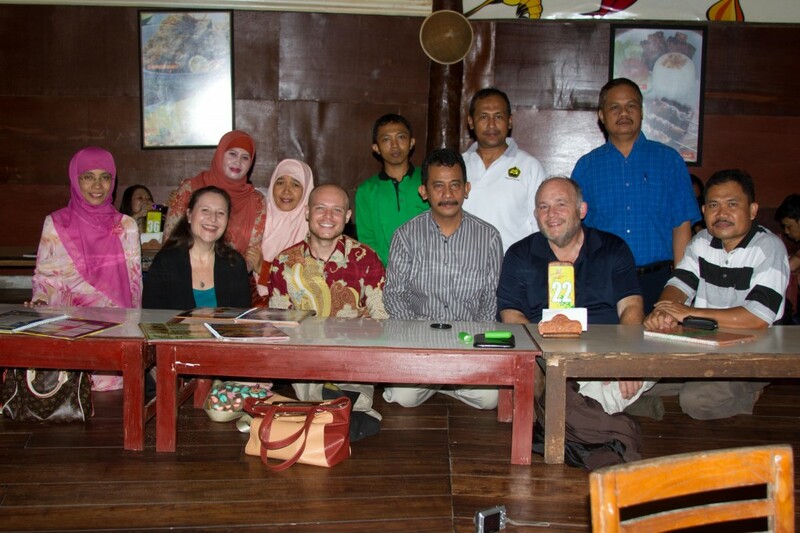 Thanks to Jared we were encouraged and able to taste many wonderful new foods, flavors and fruits( Durian is still not a delicacy for us). He is mindful of the culture, religion – of not using one’s left hand for many tasks, especially eating- a major feat as he is left handed and one we all found extremely difficult to do and remember (as was taking off our shoes before entering a room – sorry Jared, we tried). He is using his time wisely and enjoying reading, writing, traveling, meditating, teaching, spending time with his friend Max-also on the same Fulbright program, (who not only welcomed us but we got to tour his village). Jared does all this with grace and aplomb despite the intense heat, humidity (about which we moaned about continuously), tremendous amount of rain, natural disasters, and lack of hot water to name just a few. Looking back I don’t think we could have had a more incredible, amazing, eye opening, life altering, fulfilling vacation. 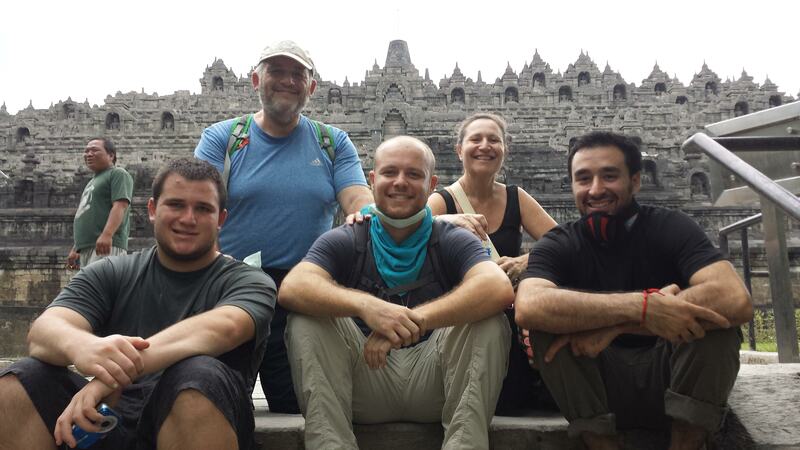 Thank you Jared for going to Indonesia- A change from me asking “Why did you have to pick Indonesia”? Lovely article. Reminded me of a lovely trip.